Then, marriage to a French "country gentleman" introduced her to château life in Normandy. Near the château is a beautiful fortified farm surrounded by moats. The building is very old - dating back to the Hundred's Years' War between France and England. The name of the farm - Le Rouvray - is derived from the medieval French word rouvre, which means 'oak'. 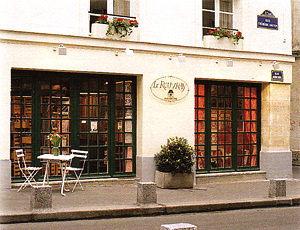 She doesn't know it at the time, but this would be the birthplace of the quilt shop that is now located in Paris. Decorator friends in Chicago want her to find French antiques in the Norman countryside so she opens an antique shop at Le Rouvray, a two-hour drive from Paris. With only a small collection of armoires and buffets, the walls look rather bare. She decides to bring a few quilts from the United States to decorate them. The quilts drew the most attention. She is soon running back and forth between Paris and Le Rouvray in an old van loaded with quilts. As they chugg past Chartres cathedral, her daughter Sylvie, then four years old, is often curled up and sleeping among the quilts. It is about that time that the Jonathan Holstein quilt collection, sponsored by the Whitney Museum, comes to the Musée des Arts Décoratifs in Paris. It is time for Le Rouvray to go to Paris. With a stroke of luck, she finds a shop in a seventeenth-century building on the picturesque Left Bank of the Seine. Overhead beams, ancient tile floors, and small windowspanes gives the place great charm and makes a perfect background for quilts. Atmosphere is added by the neighborhood itself. Situated in the heart of Paris, surrounded by narrow streets, book stalls, and nearby houseboats moored on the banks of the Seine, it couldn't have been more perfect, and it is still our home.